Summary: In "Tensei (Splendid)", Painfully shy Chiaki is devastated when she doesn't recognize any names on the roster of her new class, but the boy she's sat next to, Goto, is so outgoing and funny, they soon become good friends. Little by little, Chiaki begins to come out of her shell, but will it be enough when she realizes her feelings go beyond friendship…? 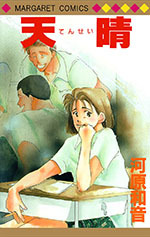 In "He Won't Love Me", everyone knows Yasuda has a crush on Honda Yuka, AKA Yuka-chan-senpai, but that doesn't deter Akira from confessing her feelings to him. But when he agrees to go out with her, she finds it's harder than she thought to be with someone who has feelings for someone else.